I've been searching ramen shops in Shinjuku area. There're many shops where they use pork bone, chicken, and/or dried sardine broth. One of the highest reviewed shops is located in Shinjuku Golden Gai. Golden Gai is East side of Shinjuku station and famous for bars and tiny eating places. The history starts back in 1950s. It used to be a black market and most of the shops here are wooden row houses which were built after WWII. In this area, approximately 200 shops carry on business. The ramen shop Nagi is sort of near the Shinjuku city office. Near the city hall, there's a little and dark stone path that leads you to Golden Gai. On the second row of narrow path, make a right turn, and walk for roughly 15 steps, there's Nagi. The sign is not loud but it was easy to find since there're a flat wooden board, lighting sign on the wall and also paper lantern. I've had dried sardine broth before, I could imagine what it's like yet I was also sure that each place has its own distinguished flavor in it. At the entrance, there's a skinny and simple red lighting box. The white light box says, "We're open on the 2nd floor." To learn this place, I checked some reviews and they said the steps are really steep and narrow (it's on the 2nd floor). And I was like, "Oh my god, it was true..."
This is how it looks from the ground floor. Going up without the wooden handrails wasn't difficult but if I had worn high heels, I would have grabbed it for sure. In front of the final steps, there's a vending machine to buy tickets of ramen and topping. When I got to the 2nd floor, I could smell strong broth. When I was wondering what the difference between Niboshi (dried sardine) Ramen and Special Niboshi Ramn, the waiter explained me kindly. Niboshi Ramen: A slice of char siu, seaweed, naganegi onion, and mianma (bamboo shoots). Special Niboshi Ramen: 2 slices of char siu, seaweed, naganegi onion, mianma, and Aji-Tama. Aji-Tama is an abbreviated word for Ajitsuke-Tamago, which is "seasoned egg" in English. It's usually soft boiled egg cooked with soy sauce based broth, so the outside of the egg (egg white) is brown, and the tone of the color varies as it depends on how the ramen shop cooks the eggs. It was my first visit, so I went with a simple ordinary Niboshi ramen this time. There're 10 seats at the counter and it's so tiny that your shoulder might touch the person next to you. Besides once people sat on the chair, it'd not be that easy to walk behind them. I handed the ticket at the table and they started making my ramen. There're more waiters than customers due to the sudden and heavy rain, and they're all joking about it. "You must be pressured as we're watching you eat." "How did you find this place? Do you write blog in English? Oh, we have several shops in Hong Kong and Jakarta." "This guy is most attractive worker here." Yes, super talkative male waiters. After about 10 minutes, Niboshi ramen was served. And it didn't feel that long as I was chatting with them while waiting. When I was about to take a photo, one of the waiters rotated the bowl and joked, "This is the ideal angle, sorry, my co-worker isn't smart enough." It was totally different from the one I had before in another ramen shop. This broth was darker and not fatty looking. I had a sip of the soup, and it had salty and soy sauce based flavor with heavy fragrance of dried sardine. It made me think I was eating slow-grilled savory fish without any piece of fish in the soup. And the noodle was interesting. In one bowl, you get to try 2 types of noodles. This yellow noodle was wavy and thick. The texture was lighter than Udon noodle but it was pretty strong. As it's wavy, the noodle caught the soup pretty well. On the right side, you can see a flat white noodle. This is called "Ittan Momen." 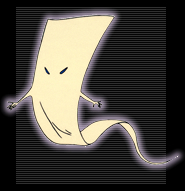 It's a character's name in "GeGeGe no Kitaro," and it looks like this. This Ittan Momen noodle was thin and was similar to won ton skin. However, it's a very large and flattened noodle like large version of fettocine. It was incredibly smooth and a little bit hard to pick up with chopsticks. Mianma was thin sliced and it also had intense soy sauce taste with sesame seeds. Those mianma I'm used to is much lighter color and not salty like this. Naganegi onion was chopped into a little dice size and it was crispy and crunchy so that it gave the ramen some fresh and additional texture. Their char siu was sliced thick, about 5mm, well seasoned. It was hard to bite off, which is far from my preference; I love soft char siu which tears and fall off from the chopsticks when I try to pull up from the soup. The soup had a great flavor of dried sardine but to me it was a bit too salty. However, as the soup was thick, it may have gone well with a bowl of rice after finishing all the noodles (and actually they have side menu of "a bowl of rice" if you'd like). I was too full to get it, but maybe next time when I'm seriously starving. When I was about to leave, they asked me if I had umbrella with me and also to be careful for the step as it's slippy. I thought it was really thoughtful of them and they did to all the customers who came in there. Many could provide decent food but some won't give good atmosphere or service with it. Even though I was there by myself, I didn't get bored or felt lonely thanks to them. If there's no waiting line outside, it'd be interesting to talk with them. Closed on every 3rd Sunday (opens only daytime).